Three new show houses unveiled at Macbryde Homes’ Bron Y Castell site in Abergele. Macbryde Homes opened the doors to its first three show homes at its Bron Y Castell site in Abergele recently, with over 100 people visiting the site over just two days. 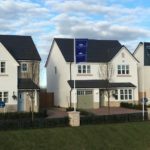 Interest in these homes follows the announcement in November last year that the North Wales housebuilder had brought forward the second phase of the development to meet demand. Construction on the 156-unit site started ten months ago, with almost a third of the homes sold by the autumn. The housebuilder reports that a further three properties were sold this weekend, with strong interest in reservations on further plots. It anticipates that half the site will shortly be sold or reserved. Homes at Bron Y Castell include two-bedroom mews style homes, through to three-bedroom and four-bedroom detached family homes. The three show homes recently launched were The Glastonbury, Wentworth and Banbury house types.